Increased awareness of the environmental effect of using fossil fuels as well as government targets to reduce carbon dioxide emissions have resulted in an increased interest in methods of harnessing solar energy. Traditional techniques are based around the photovoltaic effect and have been successfully developed to produce a commercially viable product. More interesting for a environmentally friendly scenario, microalgae, tiny, single-celled aquatic organisms, are the promising elements for the renewable energy sector both in the production of bio-diesel and in the production of bio-energy. Algae can provide oil that can be turned into liquid fuels such as biodiesel and jet fuel. Algae’s potential lies in their speedy growth rate, efficient photosynthesis and flexible habitat preferences. Many strains can grow in saltwater or wastewater from treatment plants. In open ponds or closed bioreactors, the microorganisms can potentially make more than 50 times as much oil as land plants on the same area. Scientists have studied this oil for decades as the key ingredient in the production of biodiesel, creating a fuel that burns cleaner and more efficiently than the petroleum it was born to replace. This potential fuel has a long history: in 1978 the Department of Energy launched the Aquatic Species Program to develop fuels from algae, but the program was shut down in 1996. Now algae research is surging once again in both the private and public sectors. Problems still loom, including how to best extract the oil, scale up algae farms and control contamination by unwanted strains or tiny critters like rotifers that graze on the algal crop. 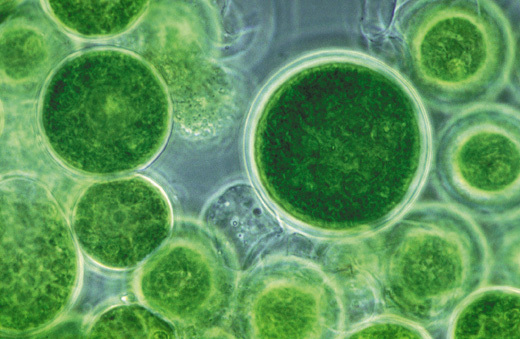 Morevoer, almost three-quarters of the sunlight energy absorbed by algae is lost before it can be turned into the sugars or starches used to make biofuels. Other several researchers all around the world are currently working on developing an alternative technique, the bio-photovoltaic device. This exploits the photosynthetic apparatus of biological material, such as cyanobacteria or algae, to convert the solar energy into electrical energy and then uses this electrical energy to drive a current or create a potential difference to drive a chemical reaction. The bio-photovoltaic device works with the simple producing water at the cathode, as in the picture. Prof. Alison Smith (Department of Plant Sciences) and Prof. Chris Howe (Department of Biochemistry) as part of the University of Cambridge Bioenergy Initiative and Prof. Laurie Peter and Dr Petra Cameron (University of Bath) have developed a prototype device using a microfluidic approach to both speed up the design and development stage and enhance mass transfer effects. This device can be used with a variety of biological material such as extracted photosynthetic material (thylakoid membranes), cyanobacteria and algae. In 2010, scientists from Yansei and Stanford University pioneered a technique by where 30-nanometre wide gold electrodes were inserted into the photosynthesizing organs, chloroplasts, of algal cells, thus managing to draw a small electrical current from algae during photosynthesis. As advances in nanotechnology lead to more energy efficient products, for example, developments in LED technology, smallscale, natural energy resources such as plant life and algae will become attractive sources of energy. It will become not just economically appealing, but essential to create a new symbiosis between man, nature and technology. So in the future it may be possible to power small electrical devices by stealing electrons from photosynthesising algae: this is hte new virtuous scenario depicted by a series of concepts, of products described in the following paragraphs. As an example, Mike Thomson has designed Latro, a speculative product that incorporates both the natural energy potential of algae and the functionality of a hanging lamp into its design.Synthesising both nature and technology in one form, Latro is a living, breathing product. Algae are incredibly easy to cultivate, requiring only sunlight, carbon dioxide (CO2) and water, thus offering a remarkably simple way of producing energy. Breathing into the handle of the lamp provides the algae with CO2, whilst the side spout allows the addition of more water and release of oxygen. Placing the lamp outside in the daylight, the algae use sunlight to synthesize foods from carbon dioxide and water. A light sensor monitors the light intensity, only permitting the leeching of electrons when the lux level passes the threshold. This way, algae can be tapped for electricity during photosynthesis without leaving the algae malnourished. The energy is subsequently stored in a battery ready to be called upon during hours of darkness. 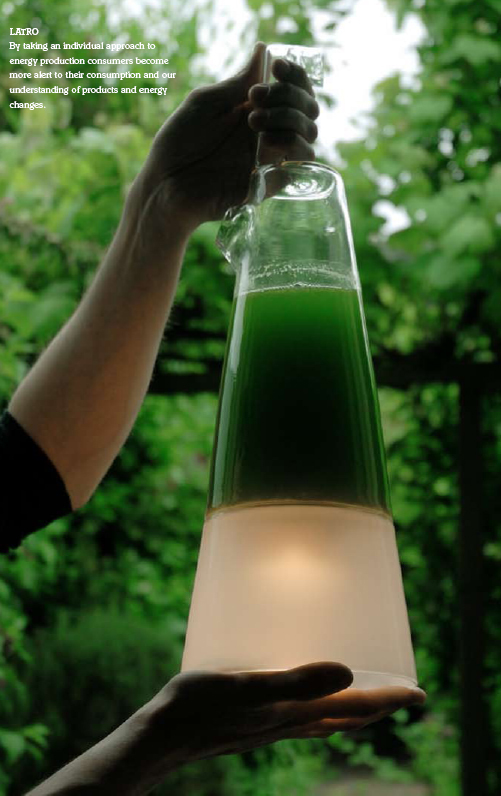 Owners of Latro have to treat the algae much like a pet – feeding and caring for the algae rewarding them with light. Algaerium, is another bio-designed project presented by the artist Marin Sawa. From Marin Sawa words: Algaerium is a domesticated habitat for living organisms. It celebrates natural phenomena and innate abilities such as photosynthesis and bioluminescence of algae by revealing them to our everyday interface. 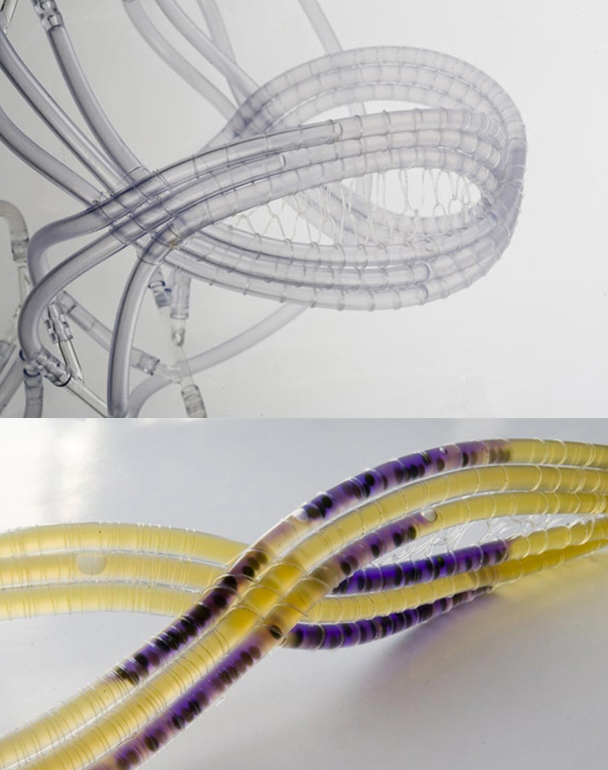 As a result, the final material constructs are a unique synthesis of cross-categorical skills encompassing traditional lacing, molecular cooking and chemistry, biology, blown glassware and fluid transfer systems. The design specially focuses on two different types of algae’s photosynthetic metabolism. Green algae convert light energy and CO2 into O2 and biochemical energy (biofuel) and white algae (bioluminescent) produce its bioluminescence from photosynthesis. The photosynthesis of green algae generates a responsive colour system. The water is CO2 sensitive and changes to purple from yellow as the algae photosynthesize. While the design using bioluminescent algae uses flow to trigger the glow of the algae. This project dimostrate together the beauty and the practicality of algae-farming, an important ecological (and commerical/industrial/culinary) practice. Los Angeles architects Emergent have designed in 2009 an installation filled with green algae that produce oil by photosynthesis. 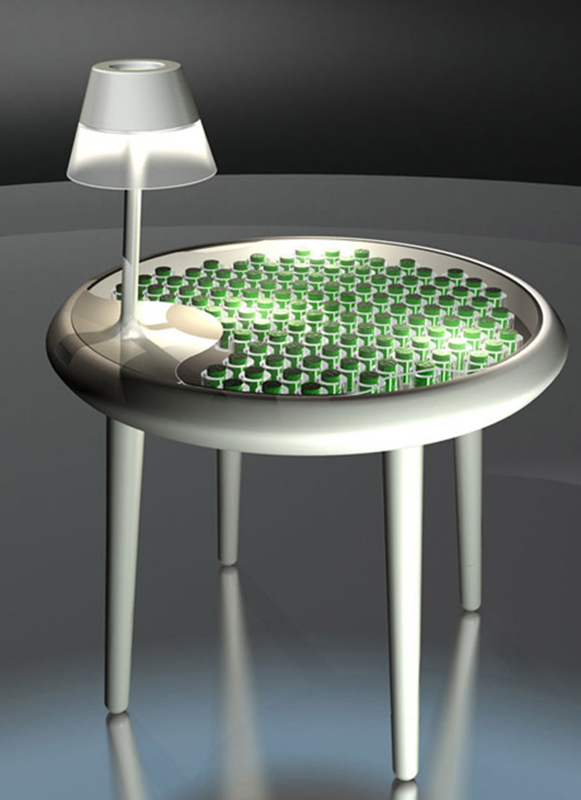 The Flower Street BioReactor will be made of transparent acrylic and contain LED lights that vary in colour and brightness to maintain ideal conditions for the algae. The installation, which will be set up in a shop window on a Los Angeles street, was designed for the Department of Cultural Affairs to raise awareness of alternative fuels. It is intended for completion by 2010. 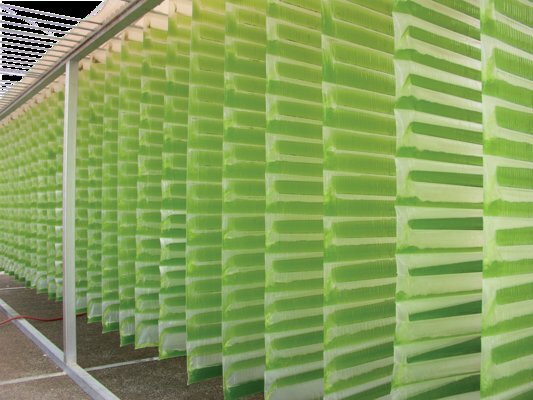 From Emergent website: The project is an aquarium-like bioreactor inserted into the facade of the building (our given site), which contains green algae colonies that produce oil through photosynthesis. The aquarium is made of thick transparent acrylic, molded to create the intricate relief on the front. 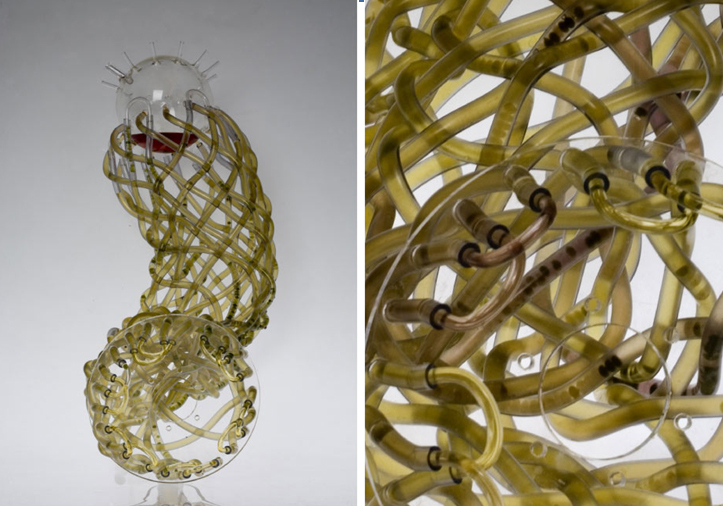 This relief tracks along with and supports an internal lighting armature which is based on the Bio-feedback Algae Controller, invented by OriginOil in Los Angeles in July of 2009. 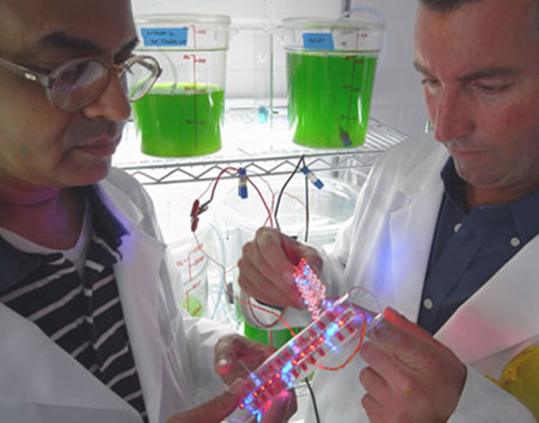 This new type of bioreactor uses tuned LED lights which vary in color and intensity to support algae growth at different stages of development, maximizing output. According to OriginOil, “this is a true bio-feedback system… the algae lets the LED controller know what it needs as it needs it, creating a self-adjusting growth system.” At night, when this system intensifies, it generates a simultaneously urban and jungle affect: glittery reflections on acrylic combine with an eerie élan vital of glowing algae. A solar array, used to collect energy during the day, is spirals and winds up into the branches of an adjacent tree, jungle-style. This energy will be stored in a battery and used during the night to run the various systems. Very recent are the project showed at the exhibition part of designersblock, during london design week 2011, from september 22nd to 25th: two research groups at london’s cambridge university, the ‘engineering and physical sciences research council’ (EPSRC) and the ‘design in science’ project, have come together to create a table, alongside a series of product concepts, that integrates biophotovoltaic (BPV) technology. 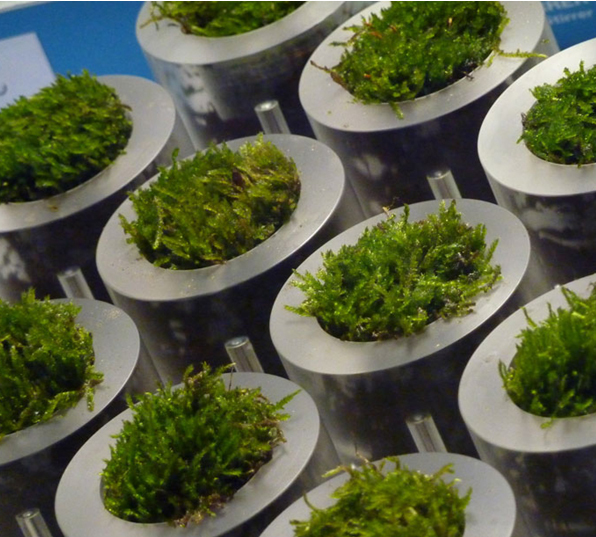 BVP devices generate renewable energy through the photosynthetic processes of living organisms such as algae and moss, in a way that scientists estimate will become a competitive alternative to solar panels within the next five to ten years. Looking towards the future of BPV technology, doctoral candidate paolo bombelli worked with designers alex driver and carlos peralta on products that range from a ‘moss table’ that generates its own electricity for a built-in light; an array of solar panels for domestic use; and a floating biophotovoltaic generator that is designed to harvest desalinated water. 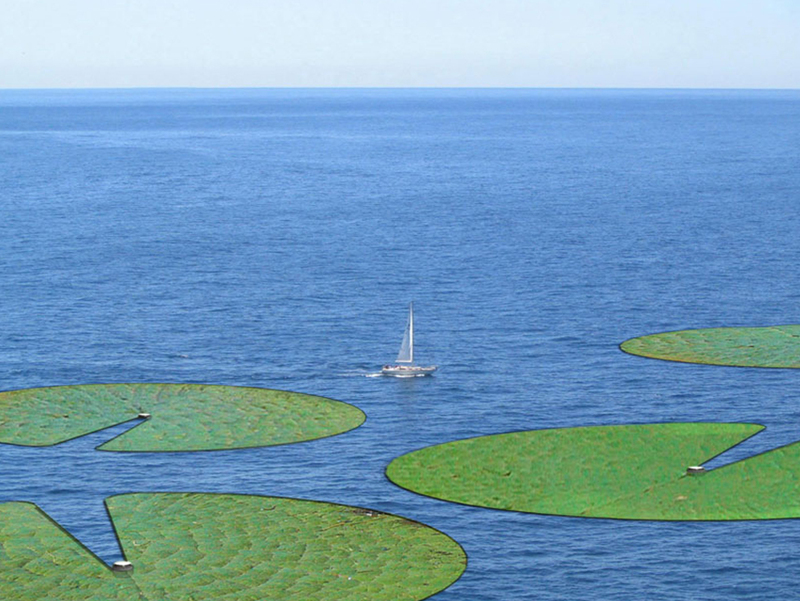 Some of the other ideas introduced by the team include BPV panels intended for domestic use, as well as an offshore power plant capable of generating 5-6 watts per square meter and which also resembles something like gigantic lily pads with each pad actually consisting of many algae-coated panels. According to the designers, this power station would even “generate energy during the night as a result of excess electrons being stored inside the algal cells during daylight hours.” They’ve also designed ‘solar masts’ that look like vertical towers covered with algae. A sort of fast-growing plant to collect and transform sun into energy. Water can also be harvested from underground to feed the plants so that the system can be self-sufficient. a floating BPV generator, designed to harvest desalinated water. 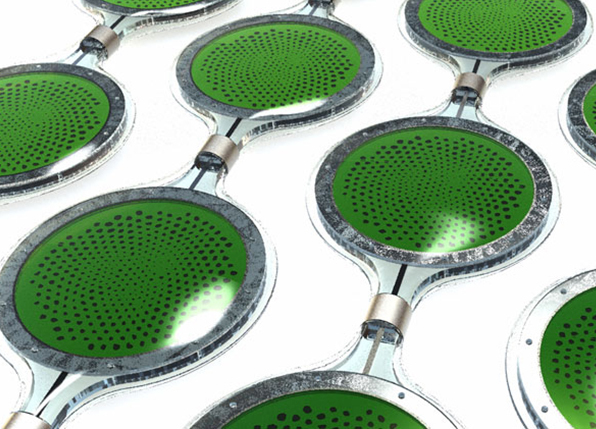 These algae-coated floating ‘lily pads’ function as a biophotovoltaic power station.